3 day Surf lesson packages provides you with 3 x 2 hour surf lessons which in most cases will run on consecutive days at the same time. 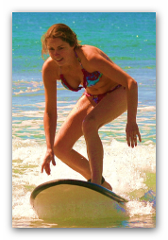 Each lesson will progress your skils from entry level surfer to competently riding waves to the beach. After School Surfing Program is aimed at students aged 6 to 17 yrs. It runs 1 day/week over the 10 week term, offering the opportunity for students to learn the art of surfing or refine their skills in a safe, supportive & fun environment.